Stonehenge; Nine circles at Stonehenge are analogues of the three regular hexagons seen below, the hexagons look like silhouettes of the cubes that they symbolize and the addition of three radial lines turns them into three dimensional images of the cubes, just how the circles analogise the hexagons is explained below. The points of hexagon A are tangent with the outer circumference of the Outer Bank, opposite points are one diameter apart and adjacent points are one radius apart, the hexagon’s 1140.48 feet perimeter is equal to the Outer Bank’s inner circumference (via 22/7), the hexagon’s area is equal to the area of a 345.6 feet diameter circle (using 22/7; diameter correct to one decimal place) the Inner Bank’s outer diameter is 345.6 feet. The inner limit of the Outer Bank and the outer limit of the Inner Bank are defined by the Ditch that uses up the area between them. The points of hexagon B are on the circumference of the crest of the Inner Bank, opposite points are one diameter apart and adjacent points are one radius apart, the hexagon’s 316.8 yard perimeter equals the mean circumference of the inner face and the hexagon’s area is the same as a 3456+ inch diameter circle, the Inner Bank’s inner diameter is 3456 inches. The points of hexagon C are on the outer circumference of the Sarsen Circle, opposite points are one diameter apart and adjacent points are one radius apart, the hexagon’s 316.8 feet perimeter is the same as the Sarsen Circle’s mean circumference and the hexagon’s area is the same as the area of a 96.0+ feet diameter circle, the inner diameter of the Sarsen Circle is 96.0+ feet. The hexagons symbolize the cubes which have multiple and interesting connections, the dimensions of the Sarsen Circle cube C are 633.6” x 633.6” x 633.6” and if we multiply it’s volume by 633.6 we produce the 0.0006336³ mile volume of the Great Pyramid’s full design. 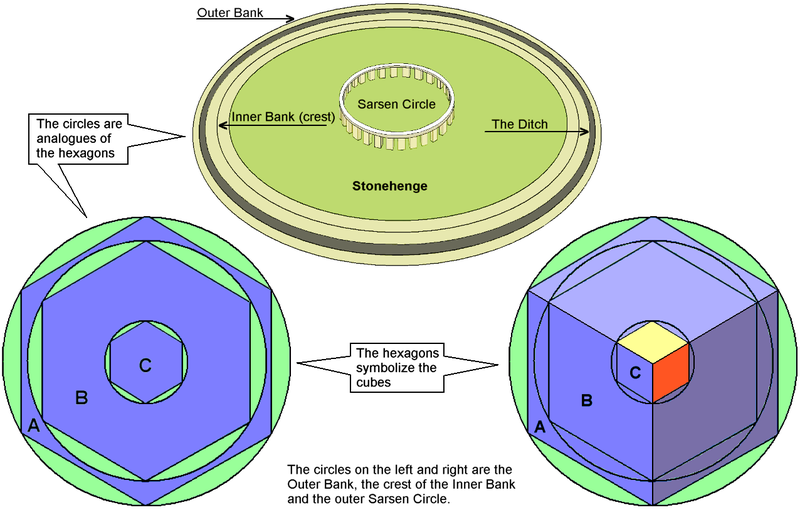 The Sarsen Circle actually symbolizes a 633.6” diameter sphere inside a 633.6” cube, the area contained inside the outer Sarsen Circle’s circumference is the same as the sphere’s surface area. The sphere and cube are a model of a mile diameter sphere inside a cubic mile, the mile diameter sphere is a very profound model of the earth on the scale of an inch to the furlong, the features of the mile diameter sphere takes a few pages of graphics and writing to explain and has been done elsewhere. The volume of the 633.6” x 633.6” x 633.6” cube C represents one part per million of a 63360” x 63360” x 63360” cubic mile and the full design Great Pyramid’s volume represents 633.6 parts per million of a 63360” x 63360” x 63360” cubic mile. Cube B has a surface area of 3.456 acres, it is symbolized by features of the Inner Bank which is 345.6 inches wide it’s inner diameter is 3456 inches, it’s outer diameter is 345.6 feet, it’s mean circumference is the product of 34.56 x 345.6 inches. The area covered by the Inner Bank is produced by taking the area of a 3456 inch diameter circle away from the area of a 345.6 feet diameter circle, 34.56 x 345.6 inches squared produces the area covered by the Inner Bank. If we add 34.56 feet to the 345.6 feet outer diameter of the Inner Bank it produces the outer diameter of the Outer Bank and 34.56 x 34.56 feet produces its circumference. Cube B is the same height (0.03168 Old English miles) as the full cone design of Silbury Hill and if we multiply the full cone’s 12545280 cubic feet volume by 0.3168 it produces the volume of the cube. Cube C and it’s 633.6 inch diameter sphere are also symbolized by the hill top design of Silbury Hill. All the cubes are interesting when compared to the Great Pyramid’s full design.